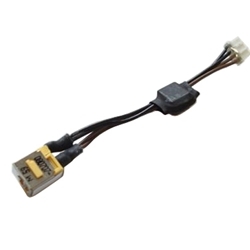 Description: New genuine Acer dc jack & cable. Yellow 65 Watt DC Jack. Does not require any soldering. Part #'s: 50.AHE02.009, 50AHE02009, 50.AJ802.006, 50AJ802006. Acer Aspire 5220, 5220G, 5310, 5310G, 5315, 5315Z, 5320, 5320G, 5520, 5520G, 5710, 5710G, 5710Z, 5715, 5715Z, 5720, 5720G, 5720Z, 7220, 7220G, 7320, 7520, 7520G, 7720, 7720G, 7720Z.